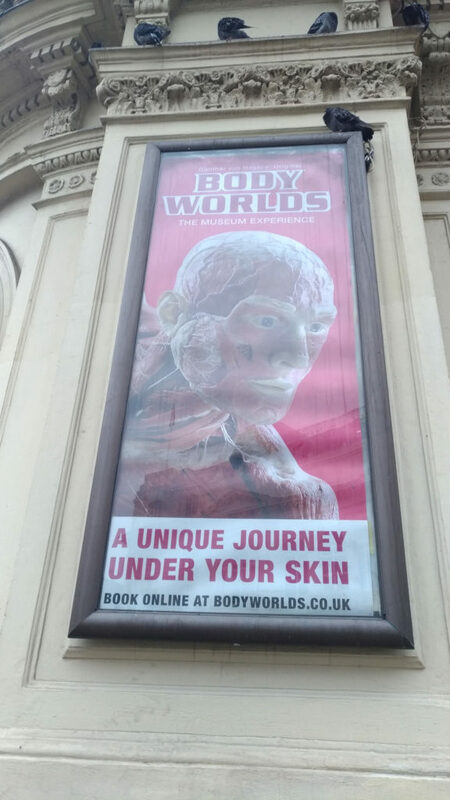 Home / Blog / Have you heard of Body World? Have you heard of Body World? Dr Gunther Von Hagens and Dr Angelina Whalley developed this incredible exhibition and opened it to the public in 1995. Since then, it has travelled to over 130 cities, and been seen by more than 47 million people. So, it’s a little bit popular then! It is designed for (mainly) non-medical people, to teach them more about the human body, how different systems (skeletal, muscular, circulatory, respiratory etc) work together, and essentially how fragile and yet amazing it all is. Their main reason for being is preventative health care. Each exhibition is focused on something slightly different – stress, movement or bad diet choices etc. So, um, how do they do it then? All of the exhibits are real human bodies. While alive, the owners of these bodies choose to donate their remains to science, for the good of our knowledge. The Institute for Plastination where the work is done is in Germany, and the bulk of the remains used are German citizens. On their death, the remains are sent to the institute. Formaldehyde is pumped through the arteries to kill bacteria. The body is then dissected to show what ever it is that the scientists feel it should be used for, possibly a diseased area, a pinned limb or a replaced hip etc, which can take up to 1,000 hours. They are then placed in a bath of liquid polymer which, over a couple of weeks, impregnates every single cell. Positioning is next, and, when you go to the exhibition, you will see a massive variety of poses, from dancers, musicians, athletes, chess players etc. Finally, the remains are set, or hardened into this position. The whole process takes about a year. So, why am I talking about it? Well, I think its an awesome teaching tool. I went to see it a couple of years ago in Johannesburg, and again last month in London, which is why it’s on my mind. The first time, the biggest impact for me, was the strength of our hip flexors, and the massive dome of our diaphragm. No wonder we battle with our knees drawing upwards while riding, or about the effect of our breathing. This time, the thing that most impressed me, was how none of the remains where symmetrical. All could be seen to be more developed through one side of their back more that the other, or one more developed arm or leg. And we wonder why we ride in a one-sided way? The other incredible thing to see at the current London exhibition is an actual horse, who was fully dissected, with an equally dissected human rider. The horse can be seen to have suffered a tendon injury. Yes, some people will find it morally wrong or offensive. Some people will be squeamish about going. But I highly recommend anyone who is interested in riding or teaching better, to keep an eye open for it to visit your country and go and have a wander around. It really is quite extraordinary!